Ht / Wt: 5'8" / 224 lb. 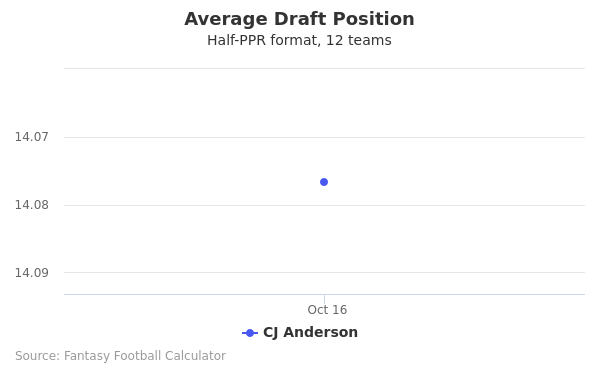 CJ Anderson's fantasy value is measured by his average draft position (ADP) in fantasy football mock drafts. 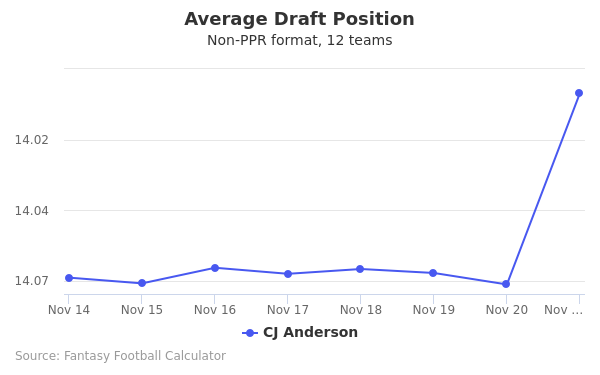 In recent drafts, Anderson's current ADP is 13.11, which indicates that his fantasy outlook is to be the 11th pick of the 13th round, and 155th selection overall. 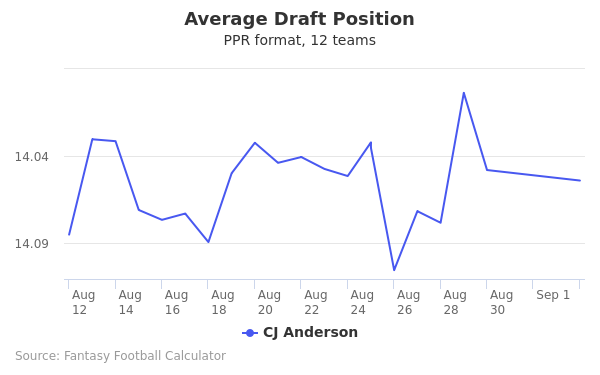 The code below will display a graph that updates every day to show the ADP data for CJ Anderson for the past 30 days in 12-team PPR leagues. Draft CJ Anderson or Tre'Quan Smith? Draft CJ Anderson or Greg Olsen? Draft CJ Anderson or Kalen Ballage? Draft Adam Humphries or CJ Anderson? Draft CJ Anderson or Marquise Brown? Draft CJ Anderson or Ronald Jones II? Draft CJ Anderson or Ted Ginn Jr? Draft CJ Anderson or Darrell Henderson? Draft CJ Anderson or Jordan Reed? Draft CJ Anderson or New England Defense? Draft CJ Anderson or Chris Herndon IV? Draft CJ Anderson or Jack Doyle? Draft CJ Anderson or Nelson Agholor? Draft CJ Anderson or Derek Carr? Draft CJ Anderson or Jalen Richard? Draft CJ Anderson or Marquez Valdes-Scantling? Draft CJ Anderson or Damien Harris? Draft CJ Anderson or Matthew Stafford? Draft CJ Anderson or Giovani Bernard? Draft AJ Brown or CJ Anderson? Draft CJ Anderson or Quincy Enunwa? Draft CJ Anderson or Noah Fant? Draft CJ Anderson or Philadelphia Defense? Draft CJ Anderson or Sam Darnold? Draft Adam Vinatieri or CJ Anderson? Start CJ Anderson or Tre'Quan Smith? Start CJ Anderson or Greg Olsen? Start CJ Anderson or Kalen Ballage? Start Adam Humphries or CJ Anderson? Start CJ Anderson or Marquise Brown? Start CJ Anderson or Ronald Jones II? Start CJ Anderson or Ted Ginn Jr? Start CJ Anderson or Darrell Henderson? Start CJ Anderson or Jordan Reed? Start CJ Anderson or New England Defense? Start CJ Anderson or Chris Herndon IV? Start CJ Anderson or Jack Doyle? Start CJ Anderson or Nelson Agholor? Start CJ Anderson or Derek Carr? Start CJ Anderson or Jalen Richard? Start CJ Anderson or Marquez Valdes-Scantling? Start CJ Anderson or Damien Harris? Start CJ Anderson or Matthew Stafford? Start CJ Anderson or Giovani Bernard? Start AJ Brown or CJ Anderson? Start CJ Anderson or Quincy Enunwa? Start CJ Anderson or Noah Fant? Start CJ Anderson or Philadelphia Defense? Start CJ Anderson or Sam Darnold? Start Adam Vinatieri or CJ Anderson? C.J. Anderson played high school football in Vallejo, California. Anderson received numerous honors, including Athlete of the Year in the region. Anderson drew the attention of the Cal Golden Bears in nearby Berkeley, Calif. He initially played college football at Laney College in Oakland. Then, he moved to Berkeley for two seasons of Division I college football. During his junior year at Cal, Anderson was the backup RB and only gained 345 yards rushing. Anderson recorded nine TDs, though. During his senior year, Anderson got more playing time and he gained 790 rushing yards to lead the Golden Bears. However, he only scored five TDs. Because Anderson did not make a big splash during his two years at Cal, he was overlooked by NFL scouts. But, highlights from his career caught the attention of some decision-makers. C.J. Anderson was not drafted in the 2013 NFL Draft. He was overlooked because he is 5'8" and his NFL Combine grade was only 52.0. Anderson's 40 time was not impressive, either. He ran the 40-yard dash in 4.60 seconds and he recorded a 32.0 inch vertical jump. The only category where Anderson was a top performer among running backs was the 20-yard shuttle. Because he did not grade well at the Combine, every team passed on him in the NFL Draft. After he went underafted, the Denver Broncos signed Anderson, as an undrafted free agent. After suffering a sports injury in the pre-season, Anderson advanced to the main roster. During his rookie season, Anderson totaled seven carries for 38 yards. The start of the 2014 season saw an increase in playing time for Anderson. His production increased as well. He rushed 179 times for 849 yards and scored 10 TDs. This is when fantasy football owners and Broncos fans started to take notice. He even made his first NFL Pro Bowl. Anderson's production declined in 2015 after his Pro Bowl season. He rushed 152 times for 720 yards and only scored 5 TDs. He was surpassed by Ronnie Hillman, who gained more yards and TDs in the Broncos' Super Bowl season. However, in Super Bowl 50, Anderson recorded 90 yards and an important TD to seal the game. This was the third-highest rushing total for an undrafted RB in Super Bowl history. Before the start of the season, C.J. Anderson nearly left the Broncos for the Miami Dolphins. Anderson was offered a four-year contract worth $18 million, but the Broncos matched the deal. He is now locked in with the Broncos at a reasonable salary. Unfortunately, Anderson's 2017 season was cut short by a knee injury. Anderson finished with 110 carries for 437 yards and 4 TDs. Broncos fans and Fantasy Football owners expected big things from him in 2016, but the Broncos' leading RB will look to bounce back in 2017. C.J. Anderson is on Twitter @CJAndersonB22. He wears #22 because 22 running backs were drafted before him in the 2013 NFL Draft. His sports jersey can be found in the NFL Shop team store.